In August, IIASA leadership and researchers joined global business leaders, investors, and academics in Alpbach, Austria, to discuss the challenges of our time, including the implementation of the Sustainable Development Goals (SDGs). How can the public, private, and social sector contribute? At the Political Symposium, co-organized by IIASA, researchers, thinkers, and entrepreneurs were debating. As strategic partners, IIASA and the European Forum Alpbach (EFA) launched the Alpbach-Laxenburg Group in 2013. In the past two years, this group held high-level retreats during Political Symposia to discuss sustainable development and the implementation of the SDGs, adopted in September 2015. 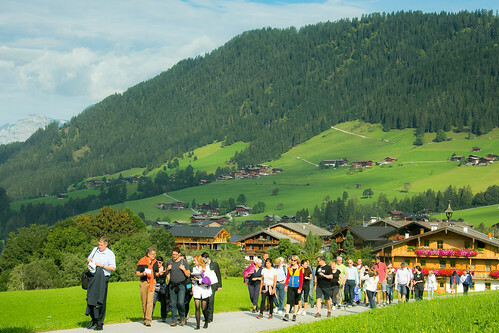 This year, global leaders from academia, business, governments, civil society, and the arts, returned to Alpbach for a third retreat from 28 August to 30 August. The Closing Plenary of the Political Symposium New Enlightenment on 30 August focused on the implementation of the SDGs, and in particular the role of the private sector. “Big business” has often been regarded as being the “part of the problem” – as polluters of the environment and drivers of inequity through increased consumerism. However, the tide is rapidly turning: a growing number of investors are divesting out of unsustainable industries and companies. This necessary and gradual transformation of the private sector to fully embrace the sustainable development agenda, requires new business and financing models, new ways of thinking and partnerships. At the Political Symposium, business leaders, investors and academics addressed challenges and also opportunities, such as how groundbreaking initiatives such as the IIASA-led Global Energy Assessment can be expanded and applied to a ‘new normal’ of how we do business for a sustainable future. The European Forum Alpbach brought together participants from all over the world and from different disciplines, and IIASA scientists participated in a number of events – detailed below. Brian Fath, researcher within the Advanced Systems Analysis Program, and Michael Thompson, a researcher within the Risk and Resilience Program, will participate in this breakout session on Resilience Science and Cultural Theory models which show that different stages of the innovation cycle require different “characters”: scientists, entrepreneurs, visionaries etc. Computational science shows that these “different characters” apply different search strategies to problem solving. Citizen and Community Science as a broker within this ecology of innovation has a special (practical) role. Gloria Benedikt, dancer, choreographer, and associate for science and arts at IIASA, will will present an interdisciplinary dance theater science performance debate that aims to bring insight to the creation of a new prosperity. 10:30 to 12:30: Sustainable Development Goals: Which Social Entrepreneurs Are Already One Step Ahead. In collaboration with the Global Impact Hub, members from the Alpbach-Laxenburg Group retreat will discuss entrepreneurial activities on sustainability. What does it mean to put political commitments like the SDGs into practice? Where do we find pioneering work in companies to support the political process and help build a sustainable future? How are these pioneers bridging the gap and providing impetus to other companies?